The Racing Point Formula 1 team has unveiled its 2019 livery and a new title sponsorship with SportPesa. 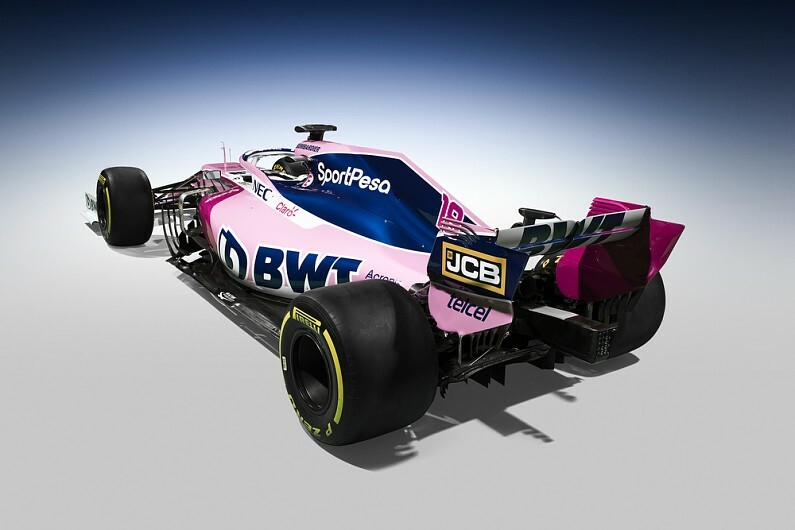 Racing Point will race in a largely pink livery that reflects ongoing support from BWT, which started sponsoring the team in 2017 in its Force India days, with blue flashes. To mark its new title sponsorship with African sports betting company SportPesa, the company’s logo appears with blue and white branding on the front wing, engine cover and rear wing. The team will also be formally branded SportPesa Racing Point F1 Team. The livery and sponsor launch was conducted using a 2018 car in the new colours, with the ’19 design not expected to be seen until the start of pre-season testing at Barcelona next Monday. Racing Point assumed control of the ex-Force India team and joined the F1 grid as a new entry from last year’s Belgian Grand Prix. At the team’s season launch in Canada, team principal Otmar Szafnauer explained: “We’ve all come to the conclusion to that basically we’re a team of racers and there’s nothing wrong with Racing Point and it encompasses who we are.